Department store retailer Macy's (M) has fallen about 40% since August 2018, including a single-day plunge of nearly 20% on January 10. Meanwhile, Macy's dividend yield has soared to over 6%, a level that causes many investors to start questioning the retailer's dividend safety. Let's take a look at why Macy's is being so badly punished by investors to assess whether this high-yield stock appears to represent a potentially solid long-term investment opportunity or an unsafe value trap to avoid. 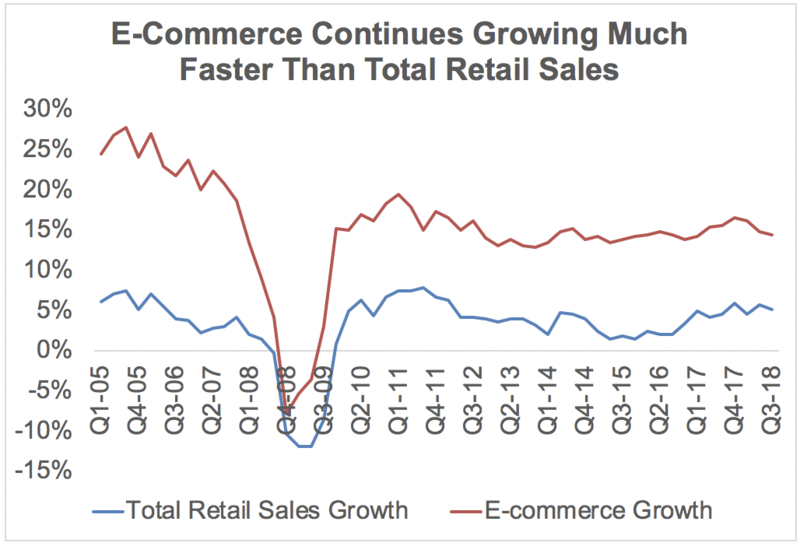 While some of Macy's decline can be chalked up to the S&P 500 suffering a 14% decline in the fourth quarter of 2018, a bigger factor driving Macy's lower is the continued fear of brick-and-mortar retail's gradual demise at the hands of e-commerce. Online sales have consistently outperformed traditional brick & mortar sales for more than a decade, as Amazon (AMZN) and other merchants continue to win retail market share. In fact, according to the U.S. Bureau of the Census, e-commerce has increased from 2.3% of total retail sales in 2005 to 9.8% today. Fortunately, thanks in part to omnichannel initiatives (incorporating online sales into traditional locations), total retail sales have continued to grow at a somewhat stronger pace than the overall economy. However, the total retail sector is far from monolithic. While many parts of retail are performing well, department stores like Macy's have struggled more than most, as seen by the continued declines in Sears (SHLD) and Bon-Ton, both now bankrupt, and J.C. Penney (JCP). 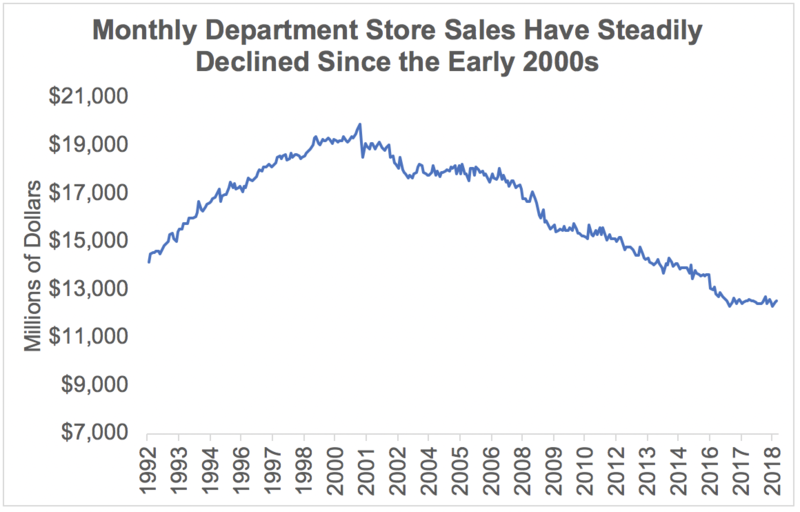 Stepping further back, monthly department store sales actually peaked in the early 2000s and now sit more than 30% below their peak. Department stores tend to focus heavily on apparel while also offering a diversified assortment of other goods. Free from many of the costs incurred with brick-and-mortar retail while also offering greater convenience for consumers, e-commerce giants like Amazon are very proficient at disrupting these categories. 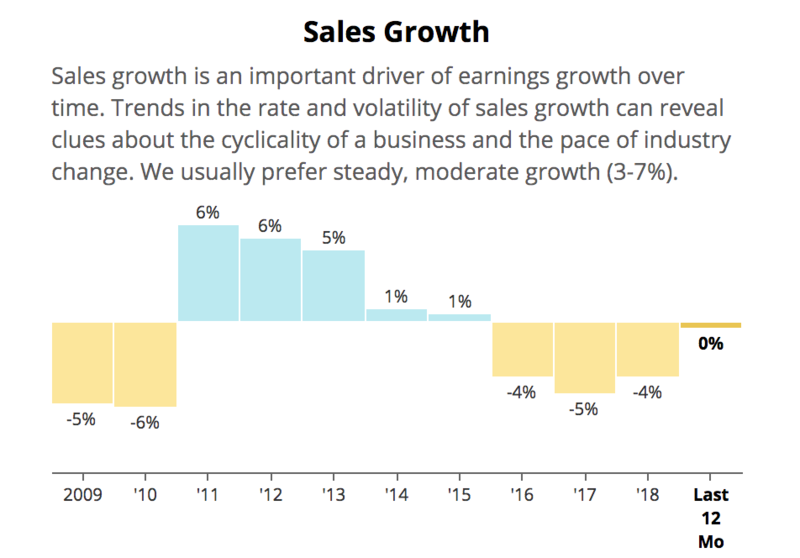 As as a result, according to Morningstar, department store market share of retail sales has fallen from 5% to 3% (-3% annual growth compared 3% for overall retail) over the past eight years. In the past few years Macy's, despite its premium focus, suffered sales declines in line with those of the Great Recession, thanks to 11 consecutive quarters of negative same-store sales growth between 2015 and 2017. Only recently did the company manage to finally return to growth for the first time in three years, and some of that improvement is probably attributable to the U.S. economy's stronger growth. Through the first nine months of 2018 Macy's revenue growth was driven by modest same-store sales growth of 2.7%. But most retailers make the bulk of their profits in the holiday quarter, which possibly caused investors' expectations to drift higher than management’s November holiday sales comp forecast of 2% growth. Sentiment was particularly strong following Mastercard's (MA) recent report that 2018's holiday retail sales were up 5.1% year over year, the strongest increase in six years. Essentially, the market was likely expecting Macy's to beat management's modest growth estimates due to what seemed to be a boom time for most retailers. However, Macy's shares plunged 18% on January 10 when the retailer announced that its holiday same-store sales grew just 1.1%. This implies that Macy's overall business model, despite a multi-year turnaround effort and strong retail conditions, might remain in the crosshairs of the secular decline in department stores. Management has now lowered its full-year comps outlook to 2% (down from 2.4% in November) and also announced it was having to mark down excess inventory caused by weak holiday sales. As a result, Macy's reduced its 2018 adjusted EPS guidance to $3.97 from $4.20. While that's still a moderate increase from 2017, most of that growth is due to tax cuts. Macy's adjusted EPS for 2018 will still be 10% below the amount it earned in 2015. What's more, excluding asset sales, Macy's is now guiding for 2018's adjusted EPS to be 10% lower than it was forecasting in November. Essentially, Macy's, once the king of premium department stores, continues to struggle in the age of e-commerce. Even a solid quarter for retailers, in general, wasn't enough to rekindle its growth engine, suggesting Macy's is losing relevancy with consumers. Let's take a look at what Macy's struggles might mean for its dividend. Investors need to remember that management has steadily raised guidance throughout 2018 which is partly why the most recent guidance cut appears so severe. Furthermore, Macy's has actually delivered relatively well (compared to rivals) on its turnaround efforts. Macy's turnaround efforts began in earnest in 2016. A core part of the plan included Macy's closing and selling off struggling and less profitable stores (Macy's has 870 stores open in 44 states), which was expected to cut annual costs by $400 million (about 1.6% of overall revenue). Analysts estimate Macy's has $15 billion to $20 billion in real estate assets it could sell in the future, meaning that the company could potentially raise a lot of money for debt repayment and investment purposes in the coming years. While Growth50 got underway in 2018, the early success of the program (in terms of higher same-store sales) is why management is taking these strategies and applying them to another 100 stores in 2019. Over the next several years, over 50% of Macy's stores could get the Growth50 upgrade. The other key area of focus for Macy's has been on paying down debt, which is what helped kill Sears and several other department chains in recent years. Compared to 2016's high of over $7.6 billion in debt, the company has paid down $2.1 billion already, and analysts expect that figure to fall to continue falling over time. While Macy's debt situation is greatly improved, it's still far from a strong financial position. The firm's net debt / EBITDA ratio has fallen from 3.1 in 2016 to 2.7 over the past 12 months. And compared to 2009's 4.1 net leverage ratio, it's clear that management is prioritizing a stronger balance sheet to give Macy's breathing room while its turnaround continues. However, while Macy's balance sheet is stronger than before, it's still not at comfortably safe levels, especially given the cyclical nature of the business. Macy's credit rating of BBB- is just one notch above junk status, for example, and its average interest cost is 4.6%. Given that BBB-rated bonds now yield over 4.5%, up roughly 100 basis points from a year ago, it's likely that Macy's will face higher refinancing costs in the future. 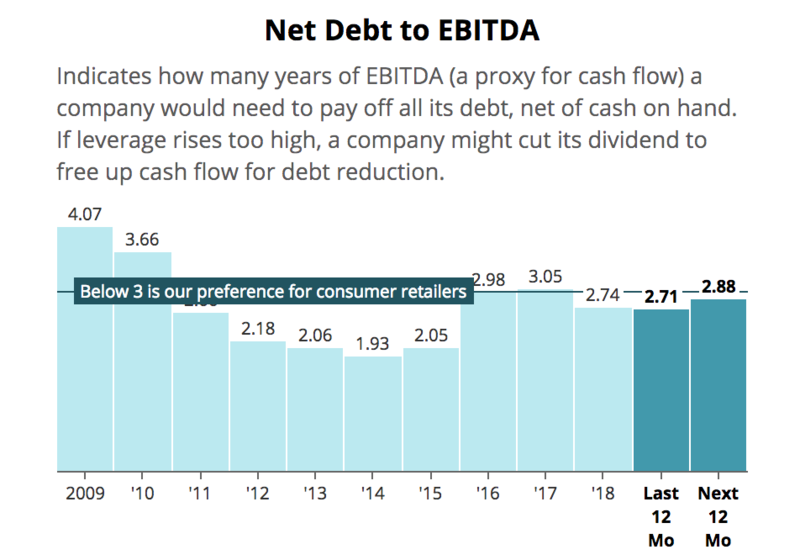 Asset sales are a convenient lever to pull to continue reducing Macy's debt load, but these actions also make it more difficult for the retailer to grow its cash flow. That might explain why Macy's dividend has been frozen since mid-2016. 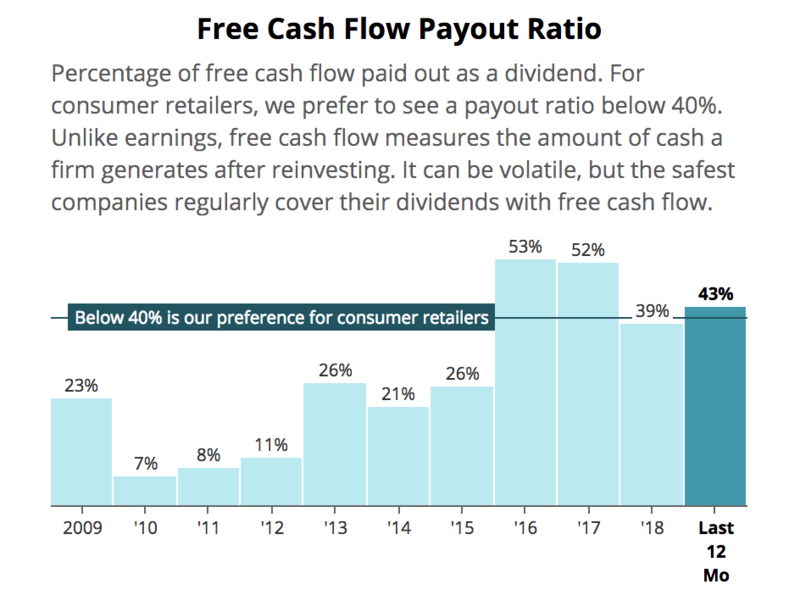 Investors likely shouldn't expect any dividend hikes in the future either since management is focused on investing in store improvements, expanding concepts like outlet stores, and deleveraging. The company's payout ratio still looks reasonable, but it does not provide much margin of safety should the economy slide into a recession, especially in light of management's capital allocation priorities to get the business turned around. Going forward, Macy's is expected to continue closing underperforming stores (eight more just added to the list for 2019), improving the ones it has via its Growth50 strategy, and basically trying to adapt as best it can to the challenges facing it due to continued growth in e-commerce. Overall, Macy's "Borderline Safe" Dividend Safety Score feels about right. The company's leverage has improved in recent years, and the dividend remains covered by free cash flow. However, the retailer's struggles to generate stronger same-store sales growth during a period of economic strength is alarming. Should Macy's turnaround efforts further stall, or the U.S. fall into a recession during this delicate time for department stores, all bets could be off (Macy's cut its dividend by 62% during the financial crisis as consumer spending declined). Macy's has made a number of strategic moves to adapt to the rise of e-commerce, a secular trend that is not going away. In recent years the firm has reduced its debt, closed and sold off underperforming stores, and reinvested in a better consumer experience at many of its remaining locations. However, despite relatively strong execution on the turnaround plan, Macy's seems unlikely to thrive in a future in which department stores become increasingly replaced by e-commerce players and omnichannel focused discount retailers (Walmart and Target are performing quite well these days). Our preference is to invest in high quality businesses that appear to have multiple paths to achieve profitable long-term growth. Macy's does not fit this profile based on what we know today, and its seemingly low valuation appears to be well earned due to the secular growth headwinds the business faces. Conservative income investors are likely better served seeking yield elsewhere.